Since 1979 Hammerworks has been meticulously handcrafting Early American Home Wall Light Princeton W116 with attention to detail and historical accuracy. With its’ graceful hook and sturdy grid, this Early American Wall Lantern is both rugged and refined in appearance. Thus it is suitable for a variety of home styles from a Cape Cod Cottage to an Early American Antique. Most importantly you can choose from standard antique copper or brass finish. We also offer custom verdigris or painted black for your Colonial Wall Lanterns. In addition the rustic look blends well with many other styles, including Onion Wall Light OL10. In addition to primitive style Reproduction Wall Lanterns, you can also choose from a variety of Traditional Home Wall Lanterns. Traditional Wall Lantern Sturbridge WM102 and Traditional Wall Lanterns Small Sturbridge WML102 are especially popular. Or perhaps you prefer combining Traditional Copper Wall Lantern WM112 and Traditional Home Wall Lights WML112. All of these choices offer a formal yet classic appearance. 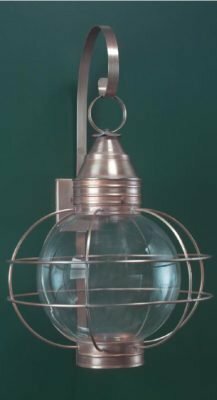 No matter what, when you choose a Traditional Copper Wall Lantern from Hammerworks you will always receive exceptional quality. Many times customers want Colonial Post Lanterns to complement their Copper Colonial Wall Light. We have several Colonial Copper Post Lanterns to choose from. 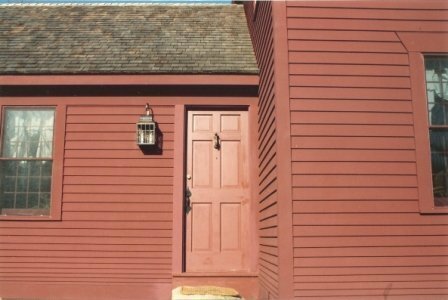 First of all the iconic Colonial Boston Post Lantern P103 is available in 2 sizes. This classic Colonial Post Lantern is a perennial favorite. 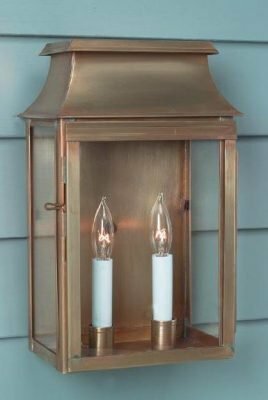 Colonial New England Style Copper Post Lantern Large Sturbridge P101 is another popular choice. We also make this in a smaller size, the Colonial Post Lantern Small Sturbridge P102. For a decidedly more rustic look consider Cape Cod Copper Post Lanterns Pyramid PP119 or Colonial Post Light: Williams PW103. No matter your style preference, you will find coordinating Colonial Wall Lanterns an Colonial Hanging Lights within our varied collections.